Preheat oven to 350ºF and line cupcake pan w/liners. Mix cake mix, pudding, sour cream, eggs, oil, and water in a large mixing bowl. Blend on low speed until dry ingredients are moistened then on medium speed for 2 minutes. Add chocolate chips to the mixture and set aside. In a separate bowl, cream sugar and cream cheese. Add vanilla and eggs. Mix until smooth and creamy. 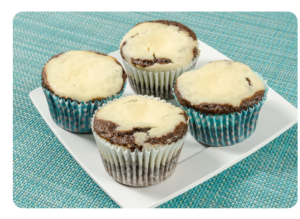 Fill cupcake liners ⅓ full with cupcake mixture, then add 1 tablespoon of cream cheese mixture. Bake for 15-18 minutes. Makes 3 dozen cupcakes.